Lugdunum and the Convenae from the first century B.C. to the seventh century A.D. Written by an acknowledged authority on this period and region, this is the first full-length book published in English on a Roman-Gallic town. Drawing from the extensive excavation that he has carried out on the site for many years, Simon Esmonde-Cleary presents this historical and archaeological survey of the important Roman and medieval site of St Bertrand de Comminges, or Lugdunum Convenarum, which was a great meeting place of routes in antiquity and stretches along the Pyrenees in the Gascony region between the Mediterranean and the Atlantic. 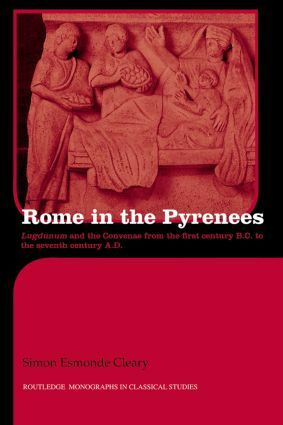 Specifically including a chapter on visiting Comminges in the present day, a part of southern France that is a popular holiday destination, Rome in thePyrenees will be invaluable reading to students and scholars of Roman provincial studies and Roman urbanism. SETTING THE SCENE: The first century B.C. CREATING THE ROMAN CITY: The first century A.D. THE CITY IN ITS SPLENDOUR: The second to fourth centuries A.D. THE COUNTRYSIDE AND THE CREATION OF THE CONVENAE: The first to fourth centuries A.D.
FROM LUGDUNUM TO CONVENAE: The fifth to eighth centuries A.D.